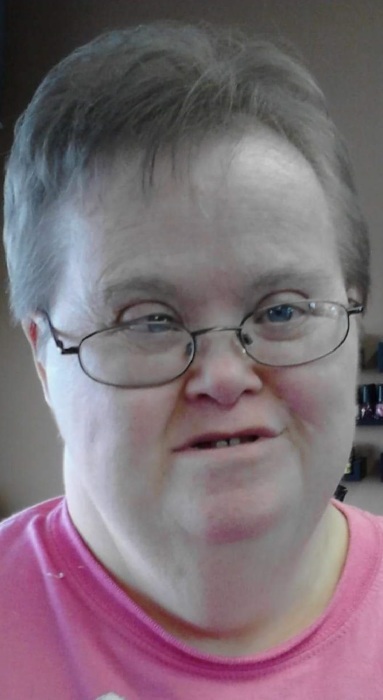 Rachel Hope Smith, 60, of Van Wert died Sunday afternoon, January 13, 2019 at Vancrest of Payne. She was born December 4, 1958 in Van Wert to the late Franklin D. Smith, Sr. and Luella (Hainline) Smith Garrett, who survives of Van Wert. Rachel is also survived by her sister, Arnelle (Ryan) Adam of Convoy, Ohio; brothers, Franklin D. (Brenda) Smith, Jr and Troy (Brenda) Garrett, both of Van Wert; nieces and nephews, Zackery and Allison Smith, Rustin Adam, and James and Beth Garrett; and a great niece, Ellie Adam. Rachel was baptized in the Nazarene church. She worked in the Thomas Edison Workshop in Van Wert. Rachel enjoyed people. She loved to give hugs, no matter who or where you were she wanted to make sure you were doing ok. Rachel also enjoyed watching sports, dancing, tickling, and a good plate of spaghetti. Funeral services for Rachel will be 10:00 AM on Wednesday, January 16, 2019 at Alspach-Gearhart Funeral Home & Crematory with Rev. Stuart Wyatt officiating. Burial will immediately follow in Convoy I.O.O.F. Cemetery. Visitation will be from 4:00-8:00 PM on Tuesday, January 15, 2019 at the funeral home. Preferred memorials may be directed to the Thomas Edison Workshop Adult Activities.